IN LAST WEEK’S ARTICLE, I showed through scripture how demonic possession is no longer possible today. For the sake of review, let me remind you of two references that deal with the binding of fallen / sinful angels. “For if God spared not the angels that sinned, but cast them down to hell, and delivered them into chains of darkness, to be reserved unto judgment;” [2Peter 2:4]. And in Jude 1:6 “And the angels which kept not their first estate, but left their own habitation, he hath reserved in everlasting chains under darkness unto the judgment of the great day.” Demons (fallen angels) are bound, awaiting the judgment. Now we turn our attention to the verse in 1Peter 5:8; “Be sober, be vigilant; because your adversary the devil, as a roaring lion, walketh about, seeking whom he may devour:” What is being taught by this verse? Before we proceed, let’s not undo the previous truth; DEMON POSSESSION IS NOT POSSIBLE TODAY. Zechariah 13:2 prophesied it, and the New Testament confirms it. So whatever 1Peter 5:8 teaches, it cannot include the demonic possession of one’s person. We first read of Satan in the book of Genesis. There is no information given about his origin, but the Bible displays his working throughout. He is called the “adversary” in our passage and seeks to supplant the authority of God [Luke 4:7]. He is a liar, and the father of lies [John 8:44]. 1John 3:8, says that the devil sinned from the beginning and has been condemned [1Timothy 3:6]. Satan is also called the “god of this world” [2Corinthians 4:4]. “World” as used in this context is speaking about people who are separated from God, people who are doing what is right in their own eyes and not following the will of God. Paul wrote in Ephesians 2:1-2, that He (Christ) has made alive…those who previously had walked according to the course of the world. To walk the course of the world (Satan’s playground) is to follow Satan’s example of rebellion and disobedience toward God. Verse 3 points out that these in the world, “once conducted ourselves in the lusts of our flesh, fulfilling the desires of the flesh and of the mind, and were by nature children of wrath...” This condition fits the description of the progression of sin in James 1:14-15. Just as knowing God’s truth can set one free from sin [John 8:32], “He that committeth sin is of the devil” [1John 3:8]. Although Satan is a real being, HE CANNOT IRRISISTABLY CONTROL MEN. We act as his agents when we seek to do as he does, to pervert, corrupt, depart from or misrepresent the word of God [Mat 16:23; 2Corinthians 11:3; Galatians 1:6-9; 1Timothy 4:1-3]. Just as modern day Nazi’s or Marxists act as agents for their long dead leaders, so too those who wish to follow the workings of Satan. Because they don’t have a love for the truth, “God will send them strong delusion that they should believe a lie” [2Thessalonians 2:9-12]. 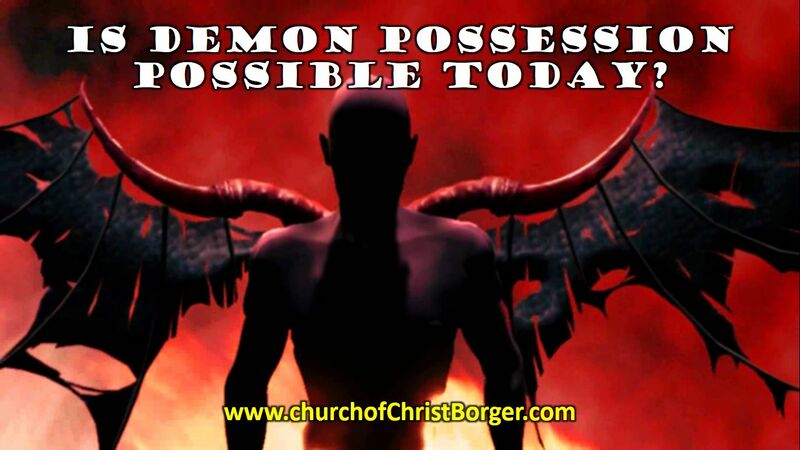 Satan doesn’t physically possess anyone today. He has always been limited, [Job 1:12, 2:6; 1Cor 10:13]. Lies and all evil was introduced into this world by Satan, and this disease of sin is spread by wicked men who are “lovers of their own selves, covetous, boasters, proud, blasphemers, disobedient to parents, unthankful, unholy, without natural affection, trucebreakers, false accusers, incontinent, fierce, despisers of those that are good, Traitors, heady, highminded, lovers of pleasures more than lovers of God; Having a form of godliness, but denying the power thereof” who will lead astray the gullible [2Timothy 3:2-6]. God’s people can resist the devil [James 4:7], and the Omnipotent God will not allow us to be tempted beyond our ability [1Corinthians 10:13]. It is the gospel of Christ, the word of God, that is our defense against Satan’s teachings. Jesus combated Satan with “it is written” and we also have the same weapon in the “sword of the Spirit, which is the word of God” [Matthew 4:4; Ephesians 6:17]. We are instructed to withstand the devil by faith [1Peter 5:9] and we know that faith comes by hearing the Word of God [Romans 10:17]. God is great, and His love is so great that He gave us His Son, to free us from sin, and “deliver us from this present evil world” [Galatians 1:4]. Is Demon Possession Possible today? The teachers of this doctrine explain demon possession today by saying that a person “allows” the demon to enter them by rejecting God’s word, allowing your heart to be ruled by habitual sin, inviting Satan [or one of his angels] to enter. They also teach that a “true Christian” can never be possessed, because they have the indwelling of the Holy Spirit, [2Corinthians 1:22; 5:5; 1Corinthians 6:19], saying that the Spirit of God would not share residence with a demon. It is true that demon possession occurred in the OT [seldom, if at all], in the Gospels and in the first century church, but the question is; Can demon possession happen today? First, it should be noted, that not every association with Satan qualifies as demon possession. For example, Jesus said to the Pharisees, “Ye are of your father the devil, and the lusts of your father ye will do” [John 8:44]. He was not speaking as if the devil gave birth to them, rather their actions indicated they were following Satan’s teaching. Second, concerning demons, we are told: There are being called “angels” [Psa. 8:5; Heb. 2:7, 9] which are higher in nature than humans. Not knowing when, some of these angels fell / sinned [2 Pet. 2:4; Jude 6]. These fallen angels seem to be the same angels as the devil’s angels [Matt. 25:41; Rev. 12:7, 9]. These may be called, “demons” [Luke 11:15], “evil spirits” [Acts 19:12-13], “unclean spirits” [Matthew 10:1], or Satan’s angels [Matt. 25:41; Rev. 12:7, 9]. Third, the bible teaches that evil spirits and demons would depart. In Zechariah 13:2, referring to the age of the Messiah, God promises; “… I will cause the prophets and the unclean spirit to pass out of the land.” This is fulfilled in the Gospels as the disciples were able to cast out demons and Jesus said, “I beheld Satan as lightning fall from heaven.” [Luke 10:18-20]. This shows the weakening power of Satan and his angels. Finally, in the New Testament, there are two references to the binding of fallen / sinful angels. “For if God spared not the angels that sinned, but cast them down to hell, and delivered them into chains of darkness, to be reserved unto judgment;” [2Peter 2:4]. And in Jude 1:6 “And the angels which kept not their first estate, but left their own habitation, he hath reserved in everlasting chains under darkness unto the judgment of the great day.” These are bound, awaiting the judgment. I’ve shown these things to folks and some have gotten very upset with the idea that demon possession is no longer possible. What a strange reaction. The truth should provide us with much comfort, it does me. Imagine living a life where the possession of your person is possible. Movies like “Damien” and the “The Exorcist” have generated fear, in the hearts of men, that it is possible to be possessed, but I find comfort in the Scriptures of God, clearly teaching that we should never fear Satan and his angels. One final note, some people say, “The devil made me do it” when referring to some sin they’ve done. No sir, he did not. God teaches us in the book of James, “But every man is tempted, when he is drawn away of his own lust, and enticed. Then when lust hath conceived, it bringeth forth sin: and sin, when it is finished, bringeth forth death” [James 1:14-15]. We can follow the teaching of Satan, but we are accountable for the sins we commit. I don’t need Satan to help me to sin, I’m doing a fine job all on my own. As 2015 ends, and 2016 is about to being, folks are putting together resolutions and plans for the new year. But, have you ever considered what Godly planning looks like? As you make your New Years Resolutions, let’s consider a Godly formula for making plans. BIBLICAL EXAMPLES OF PLANNING… The Scriptures show us many folks planning, some good and others making evil plans….. EVIL PLANS – The Psalmist said, “Who plan evil things in their hearts; They continually gather together for war. (NKJV) [Psalm 140:2]. Solomon warned his son not to go with those who plan evil, “If they say, Come with us, let us lay wait for blood,” [Proverbs 1:11]. Jesus Himself told a parable of a man who planned fraud against his master [Luke 16:4 ]. Clearly, the scriptures condemn the making of evil plans, rather we should be making Godly plans…. DAVID faced Goliath with a plan. “This day will the LORD deliver thee into mine hand; and I will smite thee, and take thine head from thee; and I will give the carcases of the host of the Philistines this day unto the fowls of the air, and to the wild beasts of the earth; that all the earth may know that there is a God in Israel.” [1Samuel 17:46]. If you’ve ever wondered why David, a man of faith, needed 5 smooth stones, this is the reason, he needed one to kill Goliath and with the others he planned to route the Philistines! GODLY PLANNING FOR OUR LIVES – As we’ve seen, God has allowed and approved of man to make plans to serve Him. Looking at additional scripture, we find that planning is wise. Our Lord commended planning when He told how the wise count the cost before building a tower [Luke 14:28], or when a King goes to battle [v31, 32]. Let us never forget that obedience to Him is like the wise one who built his house on a rock [Matthew 7:24-27]. The Prophet Isaiah wrote, “But he who is noble plans noble things, and on noble things he stands [32:8 ESV]. Shall we not, as children of God, make noble plans? The question then becomes, what are noble plans and how do we make them? Using scriptures, let’s look at a 7 step formula for making Godly, noble plans. Step 1 – KEEP GOD’S WILL IN MIND – The first, and most important step is to begin with God’s plan / will. Before making any choice or plans ask yourself, “Is this what God would want?” We should always consider whether or not our plans are involving sin, if so, it no longer qualifies as noble. Looking again to the Proverbs, “There are many devices (plans) in a man’s heart; nevertheless the counsel of the LORD, that shall stand” [Pr 19:21]. By committing our work to the Lord, our plans will be pleasing to the Lord [Prov 16:3]. “If the Lord wills, we will live and do this or that,” ought to be our beginning attitude. [James 4:13-15]. Along with faithful obedience to the commands of God [Deuteronomy 28:1-68; John 14:15; Matthew 28:20]. Step 2 – SEEK WISE COUNSEL – “Plans fail for lack of counsel, but with many advisers they succeed,” [Proverbs 15:22]. We need to seek advice, but seek it from the right sources. We need to ask GOOD PEOPLE, folks that are already living a Godly life. “Ye cannot drink the cup of the Lord, and the cup of devils: ye cannot be partakers of the Lord’s table, and of the table of devils,” [1Corinthians 10:21; Ephesians 5:11]. Remember that Paul taught, “Evil company corrupts good habits,” [1Corinthians 15:33]. We should make plans by seeking advice, [Proverbs 20:18]. Even something like building a house, and filling it with our stuff, needs wise plans and advice or it will fail, [Proverbs 20:18; 24:3-4]. Sometimes NATURE provides us wise counsel. “Go to the ant, O sluggard; consider her ways, and be wise. Without having any chief, officer, or ruler, she prepares her bread in summer and gathers her food in harvest,” [Proverbs 6:6-8]. Job said to “ask the beasts” [Job 12:7], “and they shall teach thee.” God’s own creation can be a source of wisdom and counsel. But God gives us a warning about FALSE INFORMATION. There are silly myths, false and selfish desires which cause us to seek teachers to tell us what we want to hear, [1 Timothy 4:7; Proverbs 19:2; 23:4; 2Timothy 4:3]. You’ve met those folks. They ask for advice but seldom take it, doing what they had intended from the beginning as they chase their own lusts. Step 3 – SET THE RIGHT PRIORITIES, Sometimes we make nonsinful plans, but we’ve neglected other areas of our lives. Jesus condemned the Pharisees for this very thing. “..ye pay tithe of mint and anise and cummin, and have omitted the weightier matters of the law, judgment, mercy, and faith:” Note that He wanted them to do the “WEIGHTIER MATTERS” but He also wanted them “not to leave the other undone” [Matthew 23:23]. Our first priorities are always to seek the kingdom of God, [Matthew 6:33], then the others things will be added to you. We also need to be mindful of giving, being benevolent, and taking care of our family’s needs [2Corinthians 9:7; 1Timothy 5:8]. If we seek our own selfish ambitions, we’re no longer making noble plans. Step 4 is to PUT THINGS IN THE RIGHT ORDER, to do the things that are expedient to complete our plans. “.. get everything ready for yourself in the field, and after that build your house” [Proverbs 24:27 ESV]. We’re commanded our worship be done “decently and in order [1 Corinthians 14:40], should our lives, which is a service to God, be any less? Step 5 is to DO IT, we need to get busy with our plans. Without work, no plans ever come to completion. When we work, let’s do it with all our might, [Ecclesiastes 9:10], without being slothful with our business [Romans 12:11], and to “do it heartily, as to the Lord” [Colossians 3:23]. God wants us to be active, not to be thieves, rather, “labour, working with his hands the thing which is good, that he may have to give to him that needeth” [Ephesians 4:28]. Step 6 is to EVALUATE the successes or failures of our plans. Are you still doing the right thing? Has your work changed making it sinful? Paul told the Corinthians to examine themselves, whether they be in the faith [1Cor 13:15], which must include our work activities as well as spiritual. If we stray away from the noble, Godly plans then let us bring ourselves back to the right. Step 7 is to EXPECT TROUBLE and to prepare for it. This is a realistic view of life and many of us want to avoid or ignore trouble. Unfortunately, it is a part of life and the scriptures teach this. “time and chance happeneth to them all” [Ecc 9:11], is a reminder for us that things happen. Some good, and some bad. Look at the weather, God causes the rain on the just and the unjust, but sometimes floods come with the rain. [Matthew 5:45; 7:27] Consider the recent flooding in our own area. Even the people around us will sometimes be against us. Be it for jealousy or envy, they will be obstacles to our success [1Pe 4:4]. But don’t let the ungodly of this world, keep you from doing noble things. CONCLUSION: With Godly planning, we can make the best of this world. God wants joy for us, but not just for this life. He has bigger and better plans. He has made a plan of SALVATION, which He made even before He created the world [Ephesians 1:4; Romans 16:25, 26; 1Peter 1:20]. His plans meant that His son, Christ Jesus, would be slain. This too was determined before the world was made [Revelation 13:8; Titus 1:2, 3]. His plans include for us to be a thinking people, [John 14:26]. His plans include for us to be obedient to Him [Ephesians 2:10; Titus 2:14; Matthew 28:20], to obey the Gospel [1 Thessalonians 1:8]. Finally, His plans include for us a FUTURE HOME which Jesus has gone to prepare [John 14:2]. A place that shall have no death, neither sorrow, nor crying, neither shall there be any more pain and God shall wipe away all tears [Revelations 21:1]. When did Jesus’ church begin? In Mt 16:18, Jesus said that He would build His church, but when was it built, when did it begin? The Old Testament predicted a kingdom that God would set up. In Daniel 2, we read of it beginning during the Roman Empire. All of these passages are looking forward to the church coming, and as we read the Gospels, we know that the church did not exist during the lifetime of Jesus. When we turn our attention to the end of the New Testament, we see that the church was certainly in existence. Revelation chapter 2 includes letters from the risen Savior to “the church”. James 5:14 speaks of elders in the church. Paul wrote letters teaching men how they “ought to behave” in the church. [1Tim 3:15] He also wrote in Col 1:13 that he and other Christians were removed from darkness and placed in the kingdom of God’s son. In the book of Acts, which is a record of the history of the early church, we find near the end that the church, which was “purchased with His own blood”, is in place. As we move through the book toward the beginning, we can find the existence of the church in Acts 18:22; 15:22; 14:23; 8:1; 5:11. The beginning of the book of Acts has the resurrection and ascension of Jesus, but a careful reading of the Gospels shows that the church did not exist during the lifetime of Jesus. So, the church must have begun sometime between His ascension and the early events in Acts shortly after. Let us turn to Acts chapter 2. Peter stands up during a Jewish feast day called Pentecost and preached about Jesus, the one who had recently died. In this sermon he told those listening to “Repent, and be baptized every one of you in the name of Jesus Christ for the remission of sins,” [v38]. “Then they that gladly received his word were baptized: and the same day there were added unto them about three thousand souls.” [v41]. Then in vs 47, “And the Lord added to the church daily such as should be saved.” The church had begun!! Just as promised, the Lord has built His church. Do you want to be added to the church? You can, by simply doing what every member of the church has done since that first day; Repenting and being baptized in the name of Jesus Christ for the remission of sins. Years ago while just a freshman in high school, my friend and I were horsing around on the banks the Chena river in Fairbanks. It was during “break up”, the time when the water is beginning to flow after a long winter. There were large chunks of ice on the bank of the river, and my friend decided that he should go “Huckleberry Finn” with one of those chunks of ice. As we pushed one of the larger pieces into the river, he jumped atop with a 6 foot piece of wood that he would use to steer. The trouble is this, among many others, the Chena river is much deeper than six feet and he soon found himself drifting down the river. This story got me to thinking about drifting in the church….. If you stop adding and growing, you’re actually going backwards or downwards. Just as rowing will get you closer to your destination, drifting will take you farther and farther away. Farther from the brethren, the Word and ultimately, the Lord. ARE YOU DRIFTING? If you’ve lost interest in the things of God, you may be adrift. Have you stopped a regular reading or study of God’s word? Have you stopped a regular attendance when the saints meet for worship? Have you stopped a regular coming together with church members in their homes? START ROWING…You can correct the drifting vessel, you can reset the sails, you can set a destination. Give diligence <2Pe 1:5-10> adding to your faith, making your calling and election sure. As my friend drifted, the danger ever increasing, there was a moment of hope, escape from the raging waters. Just before the river took him away, the river narrowed where he could grab an overhanging tree. I shouted for him to grab that tree that was firmly anchored on the bank. He jumped, he got wet, but he was able to firmly grasp that tree. He was saved. Let us help you reset the sails of your life. Stop drifting. If you live near Borger Texas, we would love to invite you to one of our assemblies. You’ve heard it before, some one needs to “talk about stuff”. Have you ever noticed that when people want to talk about something good, they seldom tell you “we need to talk”? Certainly, if we’ve done something wrong, we do need a good talking too. For the salvation of our souls, if we’re in sin. (Mat 18:15) But, often folks want to talk and it has nothing to do with sin, rather PREFERENCES. How are we to handle it? We need to recognize that we are all bound to the commands of God, for He has all authority, (Mat 28:18), and we’re to observe all things that Jesus has commanded, (Mat 28:20). However, we are not God. We have no authority to……. People mistake preferences for commands. We’re all different. We have different backgrounds, parenting styles, haircuts, clothing etc.. Because of that mistake, “we need to talk” comes around. There’s another problem that occurs even before the talk, Gossip. Even before researching whether a matter is sin or not, we talk to others about it. Stirring up strife, fanning the flames. (1Ti 5:13) If a person has committed sin, the last thing you need to do is tell everyone else. You also want to keep it private for another very important reason, YOU MAY BE WRONG! Before we have a talk with anyone, let’s ask 3 questions. If you can answer yes (especially the first one) then a talk is likely a good idea. If you are unable to answer “yes”, definitively, then you may want to leave it alone altogether. Then, give them time for study and repentance. The person may be learning these principles for the first time. They may not know what you know about the meaning of these passages. Give them time. Time to study and time to repent. What should you do if you’re approached? If no to any 1 of these say, “I would rather not discuss the issue.” This will help by preventing unwarranted conversations, or hurt feelings over matters of style. In Lu 17:5 And the apostles said unto the Lord, Increase our faith. What a great desire, to have an increased faith. But…. How do you increase your faith? If we study our Bibles, we can find a scripture that could help us;(2Pet 1:1-11; 5 And beside this, giving all diligence,) What is diligence? The definition is; constant in effort to accomplish something; attentive and persistent in doing anything. The biblical definition of the Greek word is quite similar; spoo-day’ “speed”, i.e. (by implication) despatch, eagerness, earnestness:–business, (earnest) care(-fulness), diligence, forwardness, haste. ***note*** I will include the Greek word after the English word along with it’s definition from WE Vines. virtue; <arete> “whatever obtains superior evaluation for a person or thing.” What do others think about you? Do you have a good report? (Phil 4:8) 1Pe 2:9 But ye are a chosen generation, a royal priesthood, an holy nation, a peculiar people; that ye should shew forth the praises of him who hath called you out of darkness into his marvellous light: How do others see us? temperance; <egkrateia> self control. Ac 24:25 And as he reasoned of righteousness, temperance, and judgment to come, (Self Control follows righteousness which is God’s claim, so self control is our response) Gal 5:23 against such is no law. Following knowledge, the point is to put our learning into action. 2Pe 1:8 For if these things be in you, and abound, they make you that ye shall neither be barren nor unfruitful in the knowledge of our Lord Jesus Christ. Imagine how your faith would grow as you diligently add these to your existing faith! Take them one at a time, or work on them in a group, but whatever you do…. Let’s go out and have a good day, for we know, only God can make our day! I live to get that question, only so that I can ask that question back. The answer reveals much, and gets us onto my favorite subject. Recently I received an answer that I had heard about, but never heard directly. This person I had asked said that they went to church so n so. (name covered for privacy) I immediately recognized who it was, it was the TV preacher from a neighboring state! That story brings me to the thrust of this article, can you go to church at your TV and what is the church? If we look to the scriptures, we will find a reference for two churches. The first would be the universal church, and the second the local church. Let’s take a look at both. The church universal is that church Jesus promised to build – (Mat 16:18). It is referred to as the body of Christ (Eph 1:22-23) and that there is only one church in (Eph 4:4). This one body / church, is made up of individual members (Rom 12:4-5; 1Cor 12:27). In (Acts 2:47) we see that the Lord alone adds to this church. Those in this one church are saved because Christ is the Savior of the body (Eph 5:23). They receive spiritual blessings, among which is the forgiveness of sins (Eph 1:7). As we continue to study, we see that members of the church universal have a requirement to not lose their head. In (Joh 15:1-8) we see the branches need to remain in the true vine, which is Christ. As we continue to study, we see evidence of a local church. In (Rom 16:16) we see a reference to churches, plural. Does this contradict the scriptures? No. We notice that Paul left Titus in Crete to “ordain elders in every city” (Titus 1:5). We see Paul in his missionary work as an Apostle to, “ordain elders in every city” indicating there were local bodies, churches. This begs the question, without a local church, how would the church universal assemble? What venue, how would you administer the Lord’s supper, the language barrier, etc.? There is a leadership to be in the local church. There is no example, command or inference of any larger earthly organization, in the scriptures, other than the local church. We also see that members are to obey them that have the rule over them in the local body / church, (Heb 13:17; 1Cor 16:13) as well as to submit to one another. Think about the wisdom of this method of organization. If error springs it’s ugly head up in one local work, it’s very likely to die there and not infect all of the churches worldwide. Additionally, when people study their bibles honestly, churches of Christ emerge everywhere. To What church do you belong?